Fabric cut to order in continuous increments, 1/2 yard min purchase. 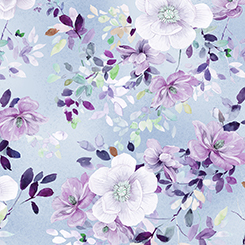 Stunning color and vivid details await in this gorgeous collection of floral fantasy. Violets, purples and periwinkles with accents of mint and pink are fashionable and fresh. Balanced with almost ice&endash;like coordinates, the richness of the deep hues are complimented nicely with light and airy prints. Think of beautiful home décor and fashion accessory items awaiting this new Studio 8 collection.